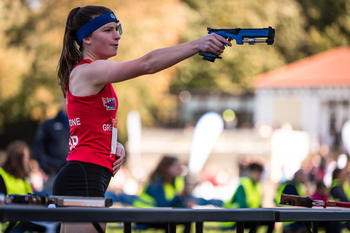 Jessica Varley of Great Britain and Bence Kardos of Hungary scooped the big individual prizes on the opening day of the 4th UIPM Laser Run World Championships in Dublin, Ireland. Varley (GBR) fought off competition from local favourite Kate Coleman Lenehan of Ireland, who secured silver in the Senior Women’s Individual event ahead of bronze medallist Barbora Ciprova of the Czech Republic. 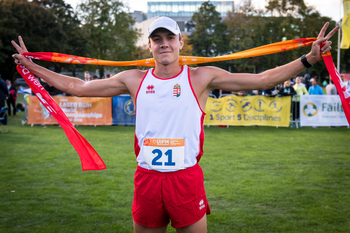 Coleman Lenehan (IRL) had the sweet consolation of winning the team gold medal in front of home supporters alongside Eilidh Prise and Grace Culhane, and Ireland also tasted success in the Senior Men’s Individual Final. Kardos (HUN) was the runaway winner, but O’Brien (IRL) showed great character to fight off competition from Harry Lane (GBR) and David Kindl (CZE), who eventually won bronze. France claimed the team gold medal. The action took place in warm sunshine on the grass surface of the cricket pitch at Trinity College, Ireland’s most historic university in the centre of Dublin. There were categories for all ages from Under 11 to Masters 60+, and more than 400 athletes came from 28 countries to participate. Great Britain topped the overall standings with 20 medals, including eight golds. France and Hungary each won six titles while Egypt and South Africa won four gold medals apiece. The variety of nationalities on the podium was a sure sign that the Laser Run is growing in popularity and depth, with previous World Championships having taken place in Perpignan (FRA), Lisbon (POR) and Cape Town (RSA). 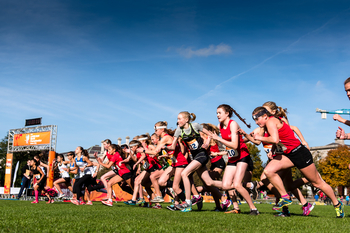 UIPM President Dr Klaus Schormann added: “The 4th UIPM Laser Run World Championships opened today in Dublin in a wonderful green environment with excellent weather, and we saw today exciting competition across all age groups. “Laser Run is one of the very important non-Olympic pillars of our Union, and we will support it more and more. You can also see that it is receiving a lot of support from National Federations. Pentathlon Ireland CEO Paddy Boyd said: “Today has been a terrific showcase for the Laser Run and wider pentathlon movement in Ireland, and across the world. “We are very proud to have created a beautiful venue for international sport here at the historic Trinity College and our athletes have done us proud, and I am sure they will do so again tomorrow.